After a quarter of a century, EBDG leads the U.S. ferry market and begins a new journey as a unique employee-owned company. 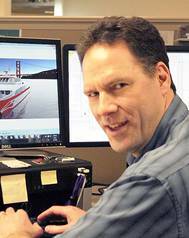 Elliott Bay Design Group (EBDG) celebrates its 25th anniversary and a successful first year following a management buyout by nearly half its employees. Since EBDG opened its doors it has designed tugs, research vessels, offshore supply vessels, and more vehicle ferries than any other U.S. firm. Brian King, Vice President of Engineering, was one of the first employees hired after the company was founded in 1988.